Having us bulk package multiple films into one package instead of individual packaging. 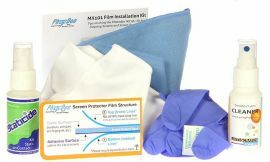 Ordering our recommended installation supplies instead of installation supplies for each protector. Having stickers put on the top/bottom films only for packs of 25 or more vs each one. * Will you need a complete install kit for each film? * Would you like your purchase to be bulk packaged? * Do you require each film to be stickered? 8pt (2mm) or 12pt (3mm) sizes are available. Placement options are bottom left, right or middle. Profanity will not be accepted. Etching will be at the discretion of Photodon. Certain characters may not be able to be etched. You may get a better multi-piece discount if you contact sales@photodon.com for a quote: Otherwise, you may proceed with your order. Should you have any questions or need help with your order, please contact us at 847-377-1185 M-F 9-5 EST or email us at sales@photodon.com anytime. Our Deluxe kit contains all the necessary items to produce a successful and professional looking film installation. It will also be useful for maintaining the cleanliness of your device for everyday use after installation. With the default “NO” we will package each film individually. Selecting "YES” reduces packaging and provides you with a discount. Stickering means a #1 sticker and a #2 sticker is placed on the film. If you do not need stickering on each film in your bulk packaged films, we will give you a discount of $0.10 per film. We would sticker only the top screen protector and the bottom screen protector in the package. The digital screens on your industrial equipment are used in extreme environments and are particularly vulnerable to damage. Plus, these HMI terminals are no small investment. Depending on your needs, Photodon has a film type to cover your device. If unsure about which film type to order, use our Film Comparison Sheet to help decide. We also offer Film Sample Packs to help with the decision-making process. Photodon's special services include: custom cutting, film layering, and installation. Shipping weight each 1 lb. Notes These films conform to flat screen types and the newer curved monitors. They do not work on the old curved CRT type screens. These are not brightness reduction films, such as neutral density filters. Korea - Traverse City, Michigan, USA. Use this questionnaire to learn about the screen protector types we have available and their different functions. If still unsure after reading our film type information, consider ordering a film sample pack. Starting at $5 and free shipping (USA) comes with a $5 coupon towards your next purchase. There's more information about our screen protectors on our Overview Page. We're available for questions at 847-377-1185, Live chat with us or email us. What is the primary function that you are looking to achieve from your screen protector? *Note, all of our screen protectors will help reduce scratches and protect your screen. All film types may not be available/recommended for all devices. The information in this guide should not be interpreted as a recommendation. 5HS: Shock-Absorbing Anti-Glare 85%.High matte finish. Provides extra protection against blunt force impact and is 60% more scratch resistant than standard screen protectors. Recommended for use on all devices, especially industrial or other field equipment. Cons: In bright sunlight, high matte finish causes gray out if not viewed straight on. Not recommended for drone cameras, EReaders, GPS, or In-Dash Systems. 6HS: Shock-Absorbing-Clear. Provides extra protection against blunt force impact and is 60% more scratch resistant than standard screen protectors. Recommended for use on all devices, especially those subject to rough handling. 9HO: Clear Glass-Like Hardness. Recommended for use on all devices especially drawing tablets, mobile & POS devices, and industrial equipment. Excellent image quality. 9H surface hardness provides extreme abrasion resistance with smooth-touch and oleophobic easy clean coating. MXH: Anti-Glare 25%. Light matte finish. Recommended for all monitors, in-dashes, drawing tablets and other mobile or stylus devices. Provides a fingerprint resistance and paper-like feel for drawing tablets. MXT: Anti-Glare 50%. Medium matte finish. Recommended for TVs, digital signage and industrial equipment. Cons: Some pixeling on small devices. Not recommended for color critical applications or small text reading. MXG: Anti-Glare 85%. Maximum anti-glare, matte finish. Recommended for large displays such as TVs and panels, but suitable for small devices such as phones. Best at minimizing overhead light reflection. Cons: In bright sunlight, high matte finish causes gray out. MXB: Blue Light Cut. Good image quality. MXB film cuts up to 93% of high-energy visible light on the violet/blue band from 400-450 nm. Recommended for persons with eye fatigue or steep pattern issues. P2L: 2-Way Privacy Filter. Adhered with the help of clear double-sided tapes and or tabs that attach to your monitor's frame. Mini-louvers embedded in film reduce screen viewing at 30°, nearly black at 45°. Cons: Loss of image clarity, slight darkening effect. P2S: 2-Way Privacy Filter Silicone. Adheres directly to the monitor with full silicone adhesive backing. Mini-louvers embedded in film reduce screen viewing at 30°, nearly black at 45°. P4S: 4-Way Privacy Filter Silicone. Provides privacy from 4 directions. Adheres directly to the monitor with full silicone adhesive backing. Mini-louvers embedded in film reduce screen viewing at 30°, nearly black at 45°. Recommended for tablets.